What is a good quality affordable dog food? Where to find affordable dog food? 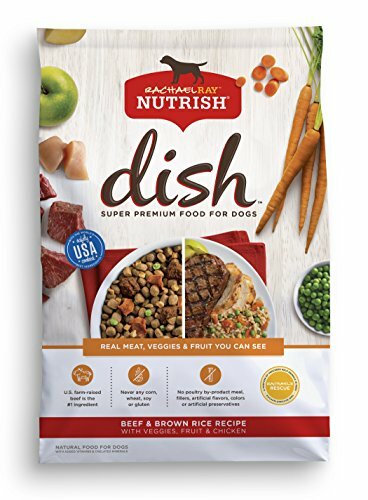 Best affordable grain free dog food? When bringing a puppy or an adult dog home; either from the shelter, from a responsible breeder or after finding one abandoned on the street, you are faced with several important choices. Where should the dog sleep, what dog harness should you use (big or small harness?) and what should you feed that adorable little (or not so little) furball? The question of what to feed a dog is a lot more complex than what many might think. Yes, you will often be recommended all the expensive brands, and told that they are the only ones that can provide your dog with the nutrition he or she needs, and as much as we would all like to give our dogs the best that there is – it sometimes isn’t economically possible. There are enough guilt trips as it is, being a pet owner, so let’s have a look at some good inexpensive dog food options available for everyone. Bringing a new furry family member home shouldn’t be a luxury only the rich can afford, at least not when it comes to dog food on the market. Don’t forget to read our buyer’s guide after the 10 affordable dog food reviews! A roasted chicken, rice and vegetable flavored affordable dry dog food from a brand which most will recognize. It is one of the first brands you are likely to come in contact with when looking for affordable pet food, and one you’ve probably rushed past at the local supermarket pet section. Pedigree Complete Nutrition is that hard-to-miss kibble packed in bright yellow bags, and most physical stores, as well as online shops, carry the brand, making it accessible and easy to find even when in a hurry. 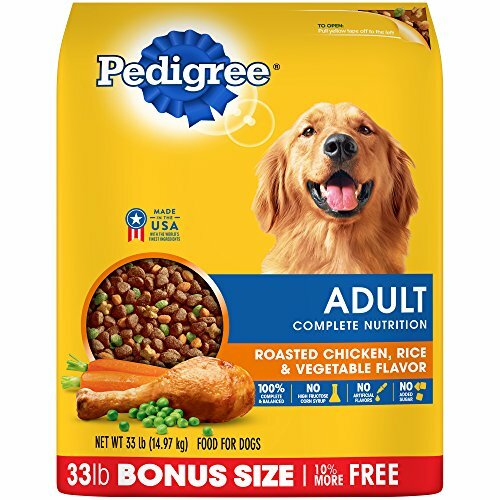 This Pedigree Complete Nutrition inexpensive dog food is made in the United States and contains no artificial flavors, high fructose corn syrup or added sugars. Why We Liked It – When looking for good affordable dog food, Pedigree is a brand that has made itself known as a low cost option. It might not compare to the best grain free dog food on the market, but sometimes it is okay to not go above and beyond. Providing a loving and safe home for a dog is the most important thing, and if the budget isn’t enough for that pricy dog food brand some dog enthusiasts go on about – that’s fine, as there are affordable wet or dry dog foods. 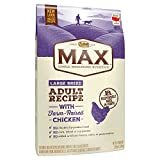 With real chicken as a first ingredient, this high protein dry dog food is worth considering when looking for the best affordable dog food for the money. This adult dry dog food contains rice, which is an easily digestible carbohydrate that can help fuel energy, as well as live probiotics for improved digestive health. This shredded dry dog food blend is also a good source of Vitamin A and Omega-6 fatty acids, which are both known to contribute to a healthier looking skin and coat. Purina Pro Plan is one of several fairly cheap dog food brands that still offer a quality dry food with nutrition that your dog needs. Why We Liked It – It is nice to see quality food where a real meat source is listed as the first ingredient, and while chicken contains a lot of water (sometimes placing it higher on the ingredients list than it might deserve), at least this dry food shows actual concern for your dog’s wellbeing by including real meat. An extra plus for the live probiotics and the healthy fatty acids it contains. For a meat-free option or treat, try these vegan dog-friendly treats. 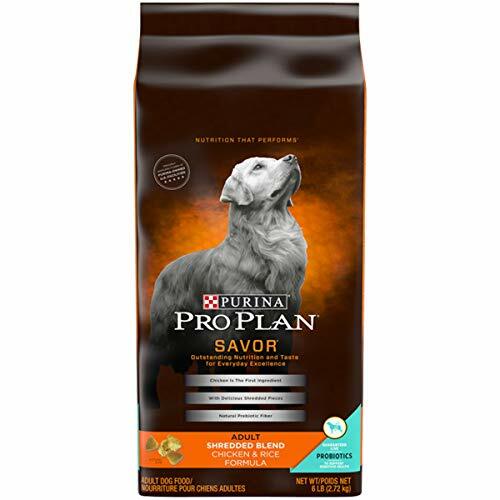 Made by the same company that makes Purina Pro Plan, this is another low affordable dry dog food you can find easily in most supermarkets worldwide. It is recognizable due to its colorful kibble with fish or meat and vegetable flavors, Purina Beneful contains 23 different essential vitamins and minerals and is both soft and crunchy at the same time. Suitable for dog breeds of all sizes, which is reflected in the size of the Purina Beneful adult dry dog food itself, and each small piece contain a good amount of vegetables and whole grains. Keep your furry friend happy and healthy without having to spend a weekly salary on each bag. 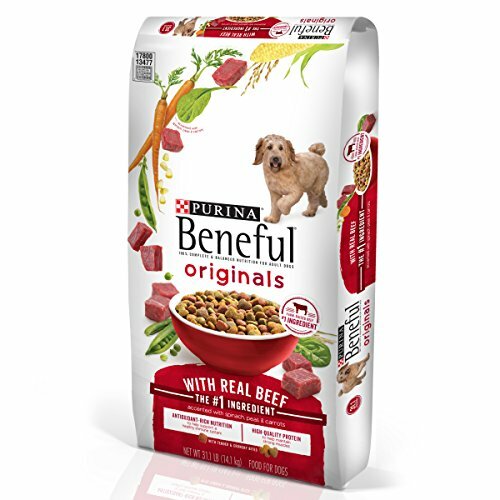 Why We Liked It – Dog food should have a real meat source as the first ingredient, and this Purina Beneful dry food does not disappoint in that aspect. This dog food for small dogs also has added vitamins and minerals, which is something to always keep an eye out for when trying to find the best inexpensive dog food on the market. These small foods are ideal for Shih Tzu’s, Yorkies and other small toy breeds. Priding itself with US farm-raised beef as the primary ingredient, this is a good dog food with enough nutrients to keep your dog going. It is a natural dog food with no artificial colors or flavors, no poultry by-products, no wheat or fillers, and it has been reinforced with healthy vitamins and chelated minerals. The adult dry dog food is packed with real ingredients inspired by Rachael’s kitchen because your furry friend deserves quality food too. A percentage from each sold bag is donated to the Rachael Ray Foundation and used for Rachael’s Rescue, which gives you as a pet owner the peace of mind that comes with knowing that you are doing something to help animals in need. Why We Liked It – Finding the best affordable dog food brand can be confusing and difficult, but here we have a natural option that donates money to animal rescue! We like that there are no unnecessary fillers and that the first ingredient is real meat from a US farm. The second ingredient is the chicken meal, which is also rich in natural protein. Looking for the most affordable grain free dog food? You might have just found it! 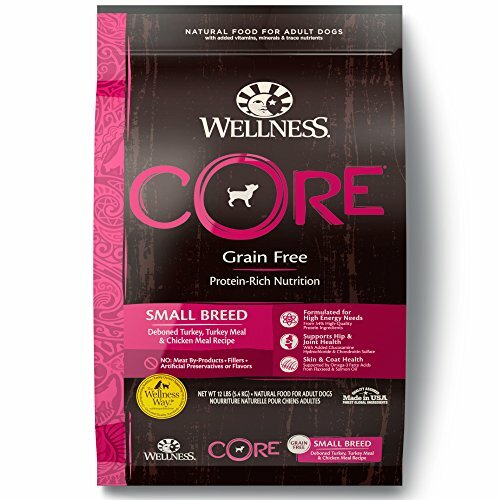 Wellness CORE affordable grain-free dog food is completely free of grains and animal by-products, fortified with antioxidants, vitamins, minerals and probiotics, and rich in protein to keep your furry friend healthy and active. Deboned turkey, turkey meal and chicken meal are the three first ingredients listed, followed by a variety of vegetables and nutritional additives. Inexpensive grain free dog food is getting more and more accessible, especially as dog owners across the country start becoming aware of the many benefits of a more meat-based diet. Wellness CORE has all the qualities to qualify for the title of best grain free dog food for the price you pay and is a good choice for the aware pet owner looking for affordable healthy dog food for the furriest family members. Why We Liked It – Reasonably priced grain free dog food is something worth looking into, as zero grain kibble tend to be more centered on the nutrients your dog truly needs. This is an affordable grain free dog food, yes, yet it is rich in content and nutritional components. It is everything you would expect from a more expensive product, at a cheaper price, making it an affordable grain-free dog food you can trust. 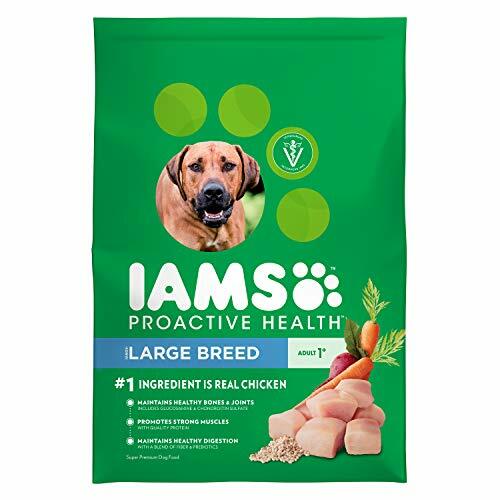 This Iams PROACTIVE HEALTH adult large breed dog food helps maintain a healthy digestion thanks to it being rich in probiotics and fiber, it promotes muscle, bone and joint health with the use of Glucosamine and Chondroitin and prides itself in being recommended by veterinarians. The first listed ingredient of this Iams PROACTIVE HEALTH adult large breed dog food is chicken, a real meat ingredient, and this best value dog food is for the largest fur friends such as Huskies, Retrievers and more – and can help them get the nutrition they need for their bodies to function properly. The same brand also carries products for smaller dog breeds such as specific dog food for Yorkies or food that is ideal for chihuahuas and some breed-specific dog supplies, so that you can find the best dog food for prices you can afford. Why We Liked It – Large dog breeds have different needs than their smaller friends, and it becomes extra important to take care of their joints and bones, as their weight can put a lot of stress on them. This adult dog food for coupon seekers has taken that into consideration by adding Glucosamine, Chondroitin, and Omega-6 to their kibble. Got German Shepherds? Try these great dog food options for German Shepherds! 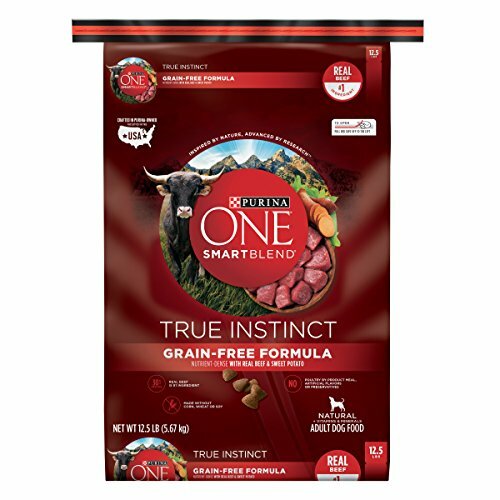 This best value grain free dog food, also from the Purina brand (see Purina Pro Plan, Purina Beyond and Purina Beneful), is low in price and very accessible. This affordable grain-free dog food comes in two presentations; one with real chicken and one with real beef does not contain any corn, wheat or soy and promises a complete and nutritional diet for your dog. Every serving provides your pup with 30% of pure protein, to aid him or her in living a healthy and active life. When researching the best grain free dog food, you want to make sure that the product you choose isn’t just taking away unwanted ingredients, but also that they are adding others. This affordable grain-free dog food has a wide range of added vitamins and minerals to keep that fur buddy both healthy and full. Why We Liked It – This affordable grain-free dog food comes in a kibble size that fits all and is a cheap healthy dog food considering what you pay for it. The sweet potato mixed with the meat gives them an irresistible flavor which your dog is guaranteed to love, making it perhaps the best price grain free dog food you can find on a budget. As a dog grows older, it tends to become even more important to make sure they are getting the nutrients they need to stay healthy and as agile as possible. This is among the cheapest high-quality dog food options you will find; made to fit the needs of a doggy senior. 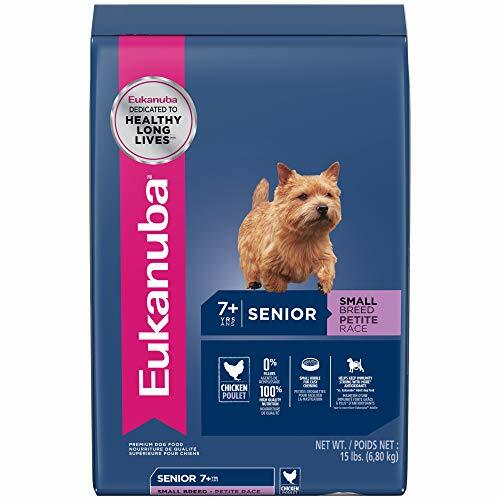 This EUKANUBA Senior dry dog food contains antioxidants to promote a healthy and well-functioning immune system, a fiber system made from beet pulp and probiotics for digestion as well as plenty of fats, vitamins, minerals and proteins to help your senior dog stay active and at an ideal, healthy weight. Why We Liked It – It is hard to point out a best low-cost dog food as all dog breeds have different needs, sensibilities to different ingredients and differently functioning digestive tracts, but something they all have in common is that they need special care as they get older. This is possibly the best adult dog food for the money it costs when it comes to senior adapted kibble, and definitely worth considering due to its rich nutritional content. For a higher quality alternative, try Orijen Senior Dog Food. The combination of real beef and 23 essential vitamins and minerals places this product on the list of options for the best reasonably priced dog food for the money. This budget dog food, however, does not have meat as a first or second ingredient, which is something to look out for, as it might not have a high enough protein content for an active dog. 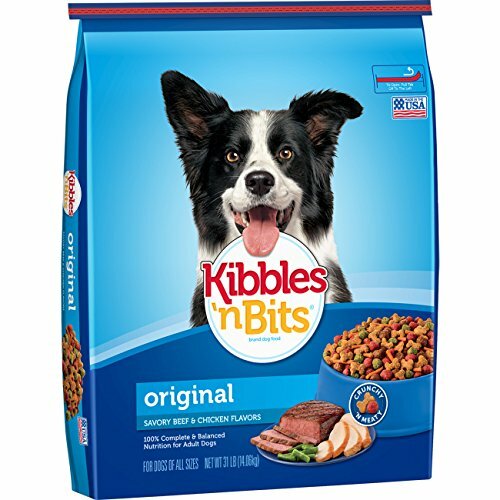 However, it is very affordable, and dogs all sizes enjoy the meaty taste and the crunchy yet soft aspect of the kibble. The cheapest dog food often comes with a compromise or two, like more of one thing and less of another, and it comes down to what works for your dog and what doesn’t. Why We Liked It – What attracts the most about this product is the low price and how easy it is to find it both online and in regular supermarkets. You never risk running out of kibble as you can find it in most stores, which makes it convenient while also functional. Is it the best budget dog food? Probably not, but it does give decent value for your money and is probably the cheapest dog food on this list. A premium dry dog food chicken and beef natural recipe where US farm-grown beef sits proudly as the first- and main ingredient. Real beef is closely followed by the chicken meal, which is also a high protein ingredient, and several different vegetables and vitamin supplements are also seen when looking through the content. 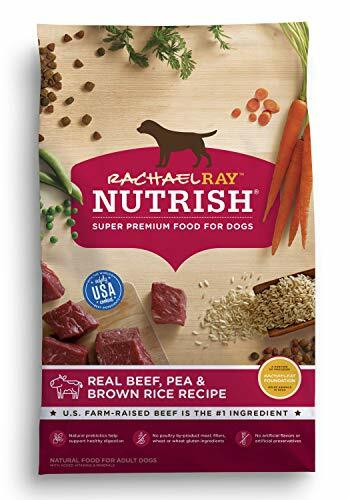 Rachael Ray gives you the best quality dog food at a lower price than what many other premium dog supplies would cost you, leaving you with money left over for other fun activities and purchases. A percentage of the profit is donated to be used by Rachael’s Rescue – an organization focused on helping and saving animals in need. Why We Liked It – This stands out among good cheap dog food brands, as focus almost entirely on natural ingredients, and completely stay clear of animal by-products, fillers, and artificial colors, preservatives and flavors. Getting adult dog food at a low price shouldn’t compromise quality, which this product proves by giving you the best dog food for the price you pay. So, what is the cheapest grain free dog food? Or what to stay clear of when looking? Can cheap be good? There are many questions running through every pet owner’s head because naturally, we want to give our dogs the absolute best. We might not feel we can afford to spend lots of money on the top kibble brand every month, however, because for most of us there are bills to pay, school uniforms to buy and a family to feed. This doesn’t mean you can’t get your dog quality food, though, you just need to know how to find good dog food on the market. It is possible to find even grain free dog food cheaper than in pet stores, and all you need to know is what to look for in order to find the best option for your dog. When shopping for dog food, regardless of whether you are looking for the cheapest grain free puppy food or the most expensive brand for your senior dog, what you want to look for is meat. Make sure the first ingredient is a meat ingredient, and that it is specified what type of meat it is. It should say for example chicken, duck, beef or salmon, because you want to know what it is that you are feeding your dog. This can become especially important if your dog turns out to have a food allergy. Something to be aware of is that chicken and duck contain a lot of water, making it place higher on the ingredient’s list due to weight, but could end up having a lower protein content once cooked after the water has been drained. It is great if the pure meat ingredient is followed by for example chicken meal, as it is a dried product with a higher protein content. It is important to always read the content of a cheaper dog food product before purchasing, as a bag can look very pretty on the outside yet contain very little nutrition for your dog. Avoid dry dog foods with animal by-products listed, as this is unspecified low-quality animal content, and can be anything from meat to crushed chicken beaks and bones. It is basically what is left over after slaughter, and not a great source of nutrition for your beloved pup. You will also want to avoid products with artificial coloring, flavors, and preservatives, as well as those with corn, wheat or similar as a first listed ingredient. Corn is not bad for a dog, but dogs do have difficulties processing corn and to get any real nutritional value out of it, making it nothing more than a rather pointless filler in cheaper dog food and not something you want to see listed first. Grain-free dog food has become popular in recent years, and many dog experts believe that it is closer to what a canine animal would eat in the wild, with fewer grain fillers and more meat and vegetables. This subject is under constant debate, but if you are interested in giving it a try to see how your dog feels about zero grain food – go for it! Grain-free dry dog foods will often have a higher meat content (though it is not a rule), as it needs to be put together with something other than grain, which regular dry dog foods tend to have a lot of. When trying to find the cheapest zero grain dog food, just make sure you check the labels to make sure it has enough protein (pay attention to the first few listed ingredients) for your dog to stay happy and healthy. Grain free dog foods are popular choices for dogs who require hypoallergenic dog food. The real difference between low cost and expensive tends to be the quality of the ingredients and the overall nutritional value, but if you know what to look for, there is nothing to say that you couldn’t find a cheaper version of a pricey brand. As covered above, it is important to learn what to look for, so that you can make the best decision for your dog. Based on what we have seen here, we would recommend Wellness CORE and the Rachael Ray high-quality dog food products, as they both list enough meat ingredients to supply your dog with the protein he or she needs. These high-quality dog food options don’t contain any artificial preservatives, colors or flavors, and have instead focused on natural ingredients. The cheapest place to buy affordable dog food is possibly Amazon or the supermarket, and once having learned what to look out for – there are quite a few good products hiding there among the rest! The internet is an excellent option, as it makes it easier to look at different budget dog food products, compare prices and read information and reviews to find out as much as you can before purchasing. Once again, we would recommend Wellness CORE high-quality dog food, due to its natural and limited ingredients, high protein content (the three first ingredients are quality meat products), and how it is packed with vitamins, minerals, antioxidants, and probiotics. A cheaper option to other similar pricy products, and one that is likely to keep your dogs health optimal throughout his or her life. It can be stressful to figure out what dog food to feed your four-legged friend, but once you learn what to look for – it can even become fun! Nobody is an expert right away, but the internet is a great resource in finding information regarding what your dog’s pet food should contain, and what it shouldn’t. Feeding your dog a healthy diet doesn’t have to burn a hole in your wallet every month! As all dogs are different, it can sometimes be a great option to go for breed-specific dog food options. Own a pit bull? Try feeding your furry friend pit bull-friendly dog foods. Don’t let the packaging fool you! Many low-quality kibble types will have bags that make the food look both delicious and nutritious, but it can be far from the truth. Always read the list of ingredients before deciding what to get. Some dogs are fine with eating the same food their entire lives, and others get bored easily and require a change in the diet every once in a while. If your dog seems to have lost the appetite, it might be a good idea to try a different kibble, just to see what happens. 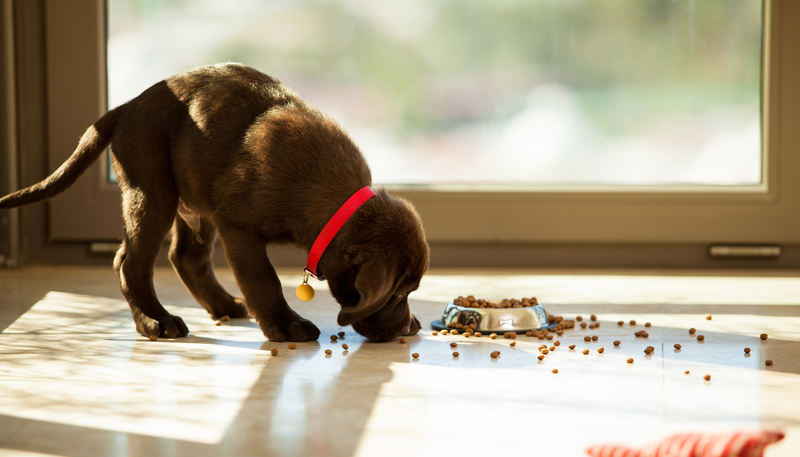 Remember to always switch slowly from one kibble to another, by beginning to mix in the new food with the old, or otherwise, your dog might get an upset stomach if they tend to have sensitive stomachs. See the top dog foods for sensitive stomachs. Read this study that debunks the myths about affordable pet foods.